The Challenge: Make someone a homemade gift to show how much you care about him/her or to thank him/her for a job well done. Well, as you may remember from Challenge #33 last Saturday I hosted a surprise birthday party for Jason to celebrate his 30th birthday, which happens to be this Saturday. This party would NOT have happened if it weren’t for my sister-in-law, Katie, who initiated the idea and pretty much organized most of it. 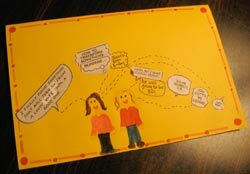 So, in order to show her how much I appreciated her help I took a page out of my own childhood- I made her a homemade card. Ironically she had brought Jason and I the funny pages a while back from her massive Sunday paper. I had them in the recycling, so I dug them out and started reading some of the captions. I ended up cutting out captions and putting them in an order to tell the story of how the party came to be. I even found a cartoon of a little blue bird, which is symbolic for Jason (Jbird). The text came together perfectly. I added some fancy little borders on the card and away it will go to her house. I plan to mail it so she will be surprised, unless of course she reads this first. I hate origami. I only wish I knew that before I started this challenge. 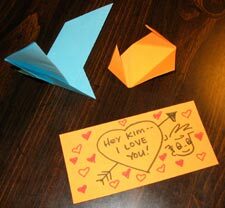 I spent half an hour trying to make some “simple” origami creations for Kim. We just got back from Tampa, and she manages all of the details for my speaking engagements. I wanted to thank her all of her hard work — she really does a great job, and makes it look easy. I was so excited to make a little origami sculpture. “This will be so cool,” I thought. “Very creative,” I thought. “And simple, too!” I thought. Then I decided to try something a bit easier. I found a simple heart project that involved six steps and was supposed to take 1-3 minutes. Ten minutes later and I was ready to throw my origami rejects out the window. Finally, I decided to express my appreciation the old fashioned way: marker on paper. My final project was not as exciting as I had hoped, but at least it was sincere. And frustrating. I know someone going on a trip and I made a card (from my daughter) that’s going to arrive just before she goes home. I used some way cool stickers, hopefully she’ll appreciate my creativity. Tonight I baked some cookies from a favorite family recipe – Cowboy Cookies! There are a lot of memories wrapped up in the smell of chocolate and oatmeal fresh from the oven – YUMMY! They will be a gift for friends of mine who have asked me to be the godmother to their second child. I am grateful for the honor. I want you to know that before we met I couldn’t sleep too well…I was sorta lonely…and wandered around aimlessly doing a lot of talking to myself…and then I met you…a nice person… ZOWIE… now my life is bright and sunny and I’m happy-happy-happy…I just wanted to tell you that I’m real glad we met. I also found the plastic yellow with black bumpy top VW bug model I made for you which was our “dream” car back then. I glued on 1 headlight, the seats and I couldn’t find 1 tire-so I put on a spare-like we use today but not available in the old days. So here is the making part: I’m making a promise to you that I’ll do the very best I can to watch my weight(go down I hope) and to implement a work out program. My family is sprent with heart problems and I can’t control my family history. But I can control what I eat and my lifestyle. I want to see our sons succeed-enjoy our grandchildren and enjoy our older years together…in good health. I pulled out the construction paper, crayons & colored pencils & made a homemade ‘thank you’ Valentine’s day card for my mom & dad. My mom is the champion of writing – she writes all 5 of us kids weekly (or pretty close to it), but do I write back? rarely! I can probably count on one hand how many times I do. I usually pick up the phone & call, which is good, but it would be nice for them to receive a little surprise in the mail too. So I did that. I hope they will get it on Valentine’s day & know how much I love them & appreciate all they have done & continue to do for me.